Technology drives so much of our world today and this is especially true in the world of Ferrari service. What is the difference between technicians today versus technicians from 30 years ago? That is like asking what the world was like before Microsoft or social media. Simply said, there is a lot that is different. A classic, pre-owned Ferrari that was manufactured in the 90’s will clearly have different technology within it vs. the later and current model Ferraris. If you go back even further to rare and vintage Ferraris, there will be zero computer components in them. For example, the 1985 Ferrari 308 4-valve has no computers in it at all, meaning there is zero ability of scanning with computers to diagnose the service issue. This also means that the repair will be either a rebuild or a mechanical repair, which brings us to the most important difference between technicians of today vs. 30 years ago: Technicians with decades of experience have the knowledge base required to fix the pre-computer-era cars. They have seen a lot and have been in many different situations with these older cars, and this is something that is crucial when you are dealing with a car of this calibre. Often, I think of the analogy of selecting the doctor I would want to perform heart surgery on me; is it the surgeon with 30 years of experience, or the med student fresh out of residency? Some may find this analogy absurd, but to many, Ferraris are not considered “cars,” they are “works of arts”. Another big difference between Ferrari technicians with decades of experience relates to the one issue that always comes up with Ferraris a few years old: Parts. Experienced technicians are likely to have one of two benefits when it relates to parts, the data base to source rare parts for older Ferraris and/or the ability to make the part. As Ferraris age, the parts become discontinued and scarce which requires someone who knows where to look to find the parts. Technicians who have been around for years have grown networks with companies all over the world to source parts. In some situations, we will have a client bring their car in for their annual Ferrari service and we will discover there is a part needed that cannot be located. When this happens, the only option is to actually make the part. A Ferrari technician with a few years experience will likely not have gained the experience to machine the part from scratch, as it is also unlikely they will have the experience with that of an older Ferrari model. Machining parts from scratch requires much experience and knowledge, and that is not something every technician (even those with years of service experience) can do. In addition, you will also need to make sure that the service center has the machines needed to make the part. There is always great value to anyone who has years of experience in any industry. When it comes to the vintage Ferrari world though, experience isn’t just a want, it should certainly be a need. 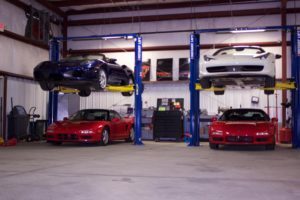 When you are scouting Ferrari service centers, be sure to investigate the shop and the technicians credentials to be sure your Ferrari will receive the proper care.